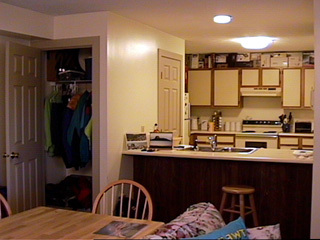 Kitchen and pantry door, with coat room at far left. Countertop and right side of kitchen. Hallway and room entrance. Home office is next door down the hall. 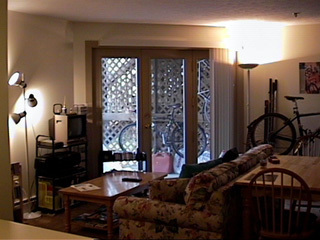 Entertainment center and patio door. Dining table is seldom used. This is my home. It's on the ground floor in an apartment complex at the end of a cul-de-sac, on a hill adjacent to Route 89. It's very quiet compared to Oak Bay Avenue in Victoria, except for occasional carpet races by the Tang-fed toddlers upstairs. Most tenants are professionals or semi-professional students at the nearby Dartmouth-Hitchcock Medical Center. There is one California, two Oregon, one Florida, one British Columbia (mine), one Massachussetts, and two (upstate) New York license plates in the parking lot. The sofa faces directly west, so I get plenty of sun in the summer. I really like the roomy kitchen, especially the counter-top. The long wall was immediately reserved for the 12' sailboard, leaving few options for the rest of the furnishings. 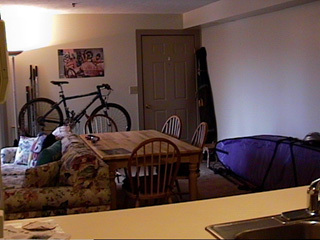 Until yesterday (10/9/99), the dining table was up against the long wall, straddling the sailboard and leaving the two end chairs sticking out into the walkway behind the sofa. The only oddball item now is a long folding table that I've left in the kitchen, which I plan to replace. I could also use a bigger TV, but that can wait. I didn't take any pictures of the two bedrooms, as I don't have a wide-angle lens. They are average size; not too big, but not small either. The far room is used as my home office. Both rooms can get quite warm from the sun. The bathroom is to the right of the kitchen. It's rather small, and lacks useful storage. My prized possessions are kept indoors, while the rest are secured on the "deck". There's plenty of interior storage for my shop tools and supplies. 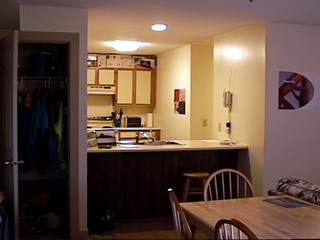 Some of the kitchen cabinets are mostly empty. The coat room has more sports equipment than coats. Posters are VW and cycling promotional literature. More than good enough to call home.